Sierra Leone Football Association's presidential election has been put on hold by world governing body Fifa. It follows the recent controversy surrounding the electoral process which came as a result of government interference in football matters. The SLFA was set to hold its election this weekend after two postponements and despite Sports Minister Paul Kamara's attempt to cancel it. But Fifa has recommended the SLFA should not go ahead. Earlier in the week minister Kamara dissolved the SLFA board because he is unhappy that Rodney Edmond Michael is a candidate to replace Nahim Khadi, who resigned as the SLFA president last week. A joint delegation from Fifa and Africa's football governing body, Caf is due in Freetown this week to talk to main stakeholders about the elections. "We understand that the situation is quite complicated following the resignation of both the SLFA President and Vice-President and that the electoral process was marked with controversies," Fifa wrote in a letter to the SLFA. "Under these circumstances, we strongly recommend you not to hold the elections for the upcoming weekend as planned. "We can confirm that a joint Fifa and Caf mission will carry out a visit on 15 and 16 September 2012. "Its scope will be to meet the main stakeholders and to provide Fifa and Caf with a subsequent report to be discussed at the next Fifa Associations Committee scheduled on 24 September 2012." 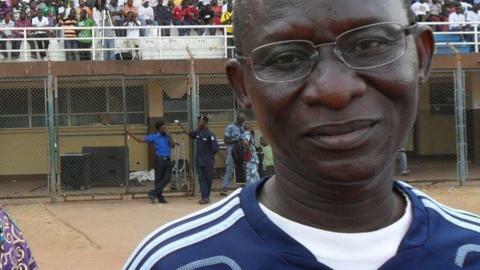 Minster Kamara has insisted that former Sierra Leone Premier League board chairman Michael cannot run for the SLFA presidency because he has banned him from all football activities. Earlier this week, Kamara had told a local radio station: "Rodney Michael will not contest the SLFA elections, if so it'll be over my dead body." The minister has also publicly backed female candidate Isha Johansen for the SLFA's top job. But the SLFA executive and electoral committees have said that Michael is an acceptable candidate. Earlier in the year Fifa intervened in a dispute between the sports minister and the SLFA over the running of the national team Leone Stars.